The number of alcohol-impaired female drivers involved in fatal motor vehicle crashes increased in 2008, Department of Transportation officials said at the Aug. 20 launch of a nationwide enforcement campaign against drunk driving. Secretary of Transportation Ray LaHood said researchers studied fatal crash data from the National Highway Traffic Safety Administration's Fatality Analysis Reporting System, paying close attention to driver gender as well as where the crashes occurred. According to the report (.pdf file), the number of alcohol-impaired female drivers increased or remained flat in 15 states in 2008, compared with 2007, while the number of alcohol-impaired males involved in a fatal crash increased or stayed flat in 13 states. Recently released FBI data also showed an increase in the number of female drivers arrested for driving under the influence. Joining the recent resurgence of zombies in pop culture, the American Society of Safety Engineers released a horror-themed training game for teen workers. In "Don't be a Zombie at Work," players help in-game co-workers avoid becoming a "zombie" by finding tools to keep them safe on the job. The free online game is designed to teach teens the role occupational safety, health and environmental professionals play in workplace safety. An estimated 158,000 young adults are victims of work-related injuries or illnesses each year and, in 2006, 15- to 17-year-olds accounted for 52,000 workplace injuries and illnesses requiring hospital treatment, according to NIOSH. Volunteers are needed in communities across the state to help count the number of people who walk or bike to their destinations. The information being gathered this fall will be used to track progress toward the state’s goal of increasing bicycling and walking in Washington and reducing the number of vehicle miles driven. The Washington State Department of Transportation (WSDOT) and the Cascade Bicycle Club are enlisting volunteers and organizations like FeetFirst and the Bicycle Alliance of Washington to count the numbers of people bicycling and walking on paths, bike lanes, sidewalks, and other facilities on Sept. 29 and 30 and Oct. 1. WSDOT is doing this as part of the National Documentation Project, an annual bicycle and pedestrian count and survey effort that is sponsored by the Institute of Transportation Engineers Pedestrian and Bicycle Council, and to determine progress toward its goal of increasing non-motorized trips. Cascade Bicycle Club is using its network of members and other volunteers to perform the counts in selected cities (Bellevue, Bellingham, Bothell, Bremerton, Ellensburg, Everett, Issaquah, Kelso, Kent, Kirkland, Longview, Olympia, Redmond, Richland, Spokane, Tacoma, Tukwila, Vancouver, Walla Walla, Wenatchee and Yakima). Those who are interested in helping can learn more by visiting WSDOT’s Web site, www.wsdot.wa.gov/bike/Count.htm, or by contacting Cascade Bicycle Club at organizer@cascadebicycleclub.org or calling 206-957-0689. A follow-up trends report will be available in January 2010 at www.wsdot.wa.gov/bike/Count.htm. Note: Communities that participated in the 2008 count included Bellevue, Bellingham, Bothell, Bremerton, Ellensburg, Everett, Kent, Kirkland, Longview, Olympia, Richland, Spokane, Seattle, Tacoma, Vancouver, Walla Walla, Wenatchee and Yakima. Communities added in 2009 include Issaquah, Kelso, Redmond and Tukwila. WSDOT keeps people, businesses and the economy moving by operating and improving the state's transportation systems. To learn more about what we're doing, go to www.wsdot.wa.gov/news for pictures, videos, news and blogs. Real time traffic information is available at www.wsdot.wa.gov/traffic or by dialing 5-1-1. While the number of people injured in motor vehicle traffic crashes has declined in the past decade, motorcycle injuries continue to increase each year, according to a new report (.pdf file) from the National Highway Traffic Safety Administration. NHTSA researchers studied police-reported data for 2,491,000 people injured in motor vehicle crashes in 2007. Of those, 103,000 (4 percent) were motorcyclists. Motorcyclists injured in motor vehicle crashes from 1998 to 2007 have increased by 100 percent to 103,000 in 2007 from 49,000 in 1998. At the time of the crashes, 63 percent of motorcyclists injured in 2007 were wearing helmets, 30 percent were not and helmet use was unknown for 7 percent. Of the motorcyclists injured, more than 60 percent were involved in daytime crashes. Motorcyclists injured in crashes increased among all age groups, but the largest number of injuries occurred in the 20-29 age group. If you or someone you know rides, consider attending one of Evergreen Safety Council's Motorcycle Safety Courses. There is something for everyone beginners to experienced. Register today. Don't let your customers and clients become a victim. According to the Seattle PD car prowlers are prolific. Plus, some criminals re-offend immediately after release. Why do they have such an easy time? It takes less than 3 minutes to hit 5 cars. Thieves break the windows of cars that have items visible in the front seat. GPS units are hot. The criminal presses "home" on the unit to find out where the victim lives and burglarizes their house sometimes before they discover the car was broken into. 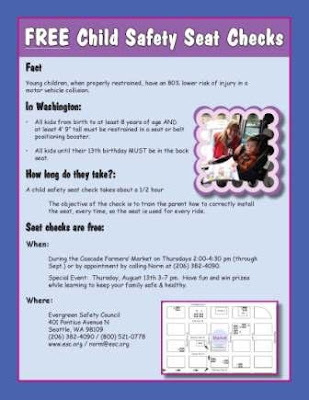 Today is the Cascade Farmers' Market which is right across the street from our office in South Lake Union and we are hosting a vendor booth at the Market in addition to setting up the pop-up tent in our parking lot to perform FREE child safety seat checks from about 2:00 - 7:00 pm. Note the extended hours! We will also have a selection of brochures, informational pamphlets and fun give-aways available at our booth in the Market. Come on out and visit us - its going to be a beautiful, cool day in Seattle. On July 29, 2009 OSHA published a notice dealing with PSM Covered Chemical Facilities National Emphasis Program. This notice describes policies and procedures for implementing a pilot National Emphasis Program (NEP) to reduce or eliminate the workplace hazards associated with the catastrophic release of highly hazardous chemicals. This notice applies OSHA-wide. Programmed inspections will take place in Regions I, VII and X. Unprogrammed inspections will take place OSHA-wide. This notice provides guidance to Occupational Safety and Health Administration (OSHA) national, regional, and area offices for implementing an NEP to reduce or eliminate workplace hazards associated with the catastrophic release of highly hazardous chemicals. Although Washington is not an OSHA state there is a portion to deal with states that will participate. Process Safety Management (PSM) has come and gone as a hot button topic and know I believe it is coming back. We do have a good deal of PSM facilities in this area, a lot having over the threshold of Anhydrous Ammonia for refrigeration. So if your facility is covered by PSM regulations you may want to take a look at the notice. Governors of three states recently signed into law bills prohibiting text messaging while driving (TWD). Oregon Gov. Ted Kulongoski (D) on July 28 signed into law House Bill 2377, which prohibits all drivers from TWD. The law states police officers can enforce the provision only as a secondary action when a driver has been detained for a suspected traffic violation or other offense. The law will not apply in 11 special cases, including emergency use. Violators are subject to a fine of $90 or less. Illinois Gov. Pat Quinn (D) signed into law on Aug. 6 House Bill 71, which bans TWD for all motorists. The law will allow police to stop and ticket drivers for sending text messages, downloading ring tones or surfing the Internet on their mobile phones. New Hampshire became the 15th state to ban TWD when Gov. John Lynch (D) signed into law House Bill 34. The law prohibits TWD and using two hands to operate an electronic or telecommunications device while driving. The law will not apply in cases of emergency or for global positioning systems and devices permanently affixed to a vehicle. Violation of the law will result in a $100 fine. All three laws go into effect on Jan. 1, 2010. This is from our friends at Feet First. Senators Tom Harkin (D-IA), Richard Burr (R-NC), Bernard Sanders (I-VT), Jeff Merkley (D-OR) and Susan Collins (R-ME) have joined together to introduce the Safe Routes to School Program Reauthorization Act (S. 1156). This is an exciting and important step forward as these five diverse Senators have agreed to champion the federal Safe Routes to School program. To get more Senators to step up as leaders on Safe Routes to School, Feet First needs your help. Your Senators need to hear from you about the importance of growing and strengthening the Safe Routes to School program in the next transportation bill. The Safe Routes to School program encourages students to walk to school by building sidewalks, making crossings safer and providing outstanding safety education and encouragement with fun activities like Walking Wednesdays. Please take just five minutes to contact your two Senators to ask them to show their support for the Safe Routes to School (SRTS) program by co-sponsoring the legislation. To do so, follow this link. An OSHA trade release on July 30, 2009 announces a new OSHA document discussing combustible dust hazards. The document, which is about 14 pages long discusses the necessity for manufacturer's and importer to evaluate the combustible dust hazard of their product. In part one section states "Regarding dusts and other particulates, a hazard evaluation must be conducted taking into consideration all discernible hazards, including that explosibility. It is incumbent upon manufacturers and importers to provide information on the potential for and control of combustible dusts." So if the manufactures are going to put this information on the MSDS, then you may need to cover this in your HazCom program. In fact you may find you do have a combustible dust hazard. The U.S. Chemical Safety Board (CSB) identified 281 combustible dust incidents between 1980 and 2005 that led to the deaths of 119 workers, injured 718 and extensively damaged numerous industrial facilities. Combustible dust is starting to take the forefront on some inspections and not only at grain elevators, but at a lot of manufacturering business. So check out your facility and pay close attention to dust buildup and have a good housekeeping program. For more information on controling combustble dust, give us a call. Today is the Cascade Farmers' Market which is right across the street from our office in South Lake Union. Once again we will be setting up the pop-up tent in our parking lot, putting out our signs, and performing FREE child safety seat checks from about 2:00 - 4:30 pm. We will also have a selection of brochures, informational pamphlets and fun give-aways available. If this time frame doesn't work for you, please contact Safety Norm or call 206-382-4090 to set up a free appointment. Registration is now open for Washington State's 58th Annual Governor's Industrial Safety & Health Conference October 7-8, 2009 in Tacoma at the Convention & Trade Center. Attend one of the largest safety & health conferences in the nation...featuring dozens of workshops, the latest technology and product exhibits...something for every business, including yours! In Seattle we have just wrapped up a beautiful Seafair weekend. Even with all the "stay-cationers" King County was able to keep its collision numbers way down. Below is a press release from the WSP. Stay safe out there. With record breaking temperatures and larger than expected crowds, the Washington State Patrol is pleased to report that there were no fatality collisions, and only one serious injury collision, on King County highways during Seafair weekend. The WSP conducted safety emphasis’ on both land and water which resulted in the apprehension of 160 impaired operators and multiple other criminal arrests in King County during the 3 days of festivities. During the land emphasis, troopers partnered with WSP’s aviation program and the motoring public to help patrol the highways for impaired drivers. During one stop on Saturday afternoon a concerned citizen called 911 to report a possible DUI on I-5 in south Seattle. WSP pilots (who are also commissioned troopers) communicated with the 911 caller and were able to locate the vehicle. The airplane followed the vehicle and observed it nearly cause a couple separate collisions while watching it drift in and out of its lane. Pilots coordinated a response and ground troopers were able to stop the vehicle before it caused a collision. The driver was subsequently arrested for DUI. This driver was one of 50 that were arrested on King County highways this weekend. Aircraft video of this stop will be available tomorrow morning upon request. King County troopers partnered with marine units from other local agencies to make this year’s annual Seafair BUI emphasis a success. This emphasis resulted in the apprehension of 110 impaired vessel operators and no vessel collisions on Lake Washington. Evergreen Safety Council produces a monthly newsletter covering a variety of safety topics. Each month we will provide a link here to the online PDF. If you would prefer to sign up to receive an electronic copy via email or hard copy via the mail, please click here. This link will also take you to a full archive with over four years of past issues. So pour yourself a glass of ice tea, sit back and read all about what's going on in the world of safety & health.